The SASSA scandal currently unfolding is probably the most dramatic expression of how far the African National Congress (ANC) has traveled since its days of opposition to apartheid. [SASSA stands for South Africa Social Security Agency, which is the agency that pays social grants to about 17 million beneficiaries.] Under apartheid, ANC activists were associated with laying down their lives in defending and advancing the interests of the mass of the people – in particular the black working class. Today, the cadre of the ANC is associated with stealing from the mass of people they used to die for. It is now commonly accepted, including in the ANC itself, that the corruption and theft of public resources is not just an isolated problem in the ANC. The general South African public and the ANC itself now accept that the problem is deep and systemic. In every newspaper, social media, and television platforms and in everyday conversation the corruption in the ANC is now standard diet, and therefore the SASSA scandal would seem to be just one other scandal among many. But the SASSA scandal, on the contrary, is important in one respect: it allows us the opportunity to develop an understanding of ANC corruption as being made up of different kinds. As a result of the political struggles in the ANC around which the SASSA debacle is unfolding, this scandal gives us an opportunity to look into a part of the ANC’s corruption that the mainstream and middle class press shies away from – the legalized corruption that the ANC has presided over for over 20 years. The corruption of the President Jacob Zuma and Gupta family alliance (aka ‘Zuptas’) is clear for all to see – and it is clear to all but its beneficiaries, that it must be opposed and struggled against. What is equally clear is that Pravin Gordhan and the finance ministers that came before him have presided over the growing impoverishment of the mass of black working class South Africans. Under their watch, wealth has become more concentrated in South Africa and has remained deeply racialized. It is equally clear that the development of the black middle class has not moved beyond flashy clothes and flashy cars – under their watch this class remains as precarious as ever. It is also undeniable that there is really no serious black big bourgeoisie to speak off – except a couple of pin-up boys who are exceptions that prove the rule. In the course of the SASSA crisis it began to emerge that there may be deep interconnections between the corruption of the Zuma group and monopoly capital in the form of Alan Gray (owners of Net1 and Cash Paymaster). Note also that another Mr. Clean, ex-Finance Minister Nhlanhla Nene, booted out by Zuma on account of his commitment to “good governance,” has also ended up at Alan Gray. Ex-Minister Nene is no flash in the pan when it comes to the revolving door between government finance leaders and finance capital. We know that ex-Finance Minister Trevor Manuel is now one of the big chiefs at Old Mutual, that other giant of South Africa’s monopoly club. Soon after leaving the Reserve Bank, Tito Mboweni joined Goldman Sachs, the U.S. investment banking house notorious for its scandalous if legal behaviour all over the world. It also turned out that the bankers of SASSA are none other than the ‘white monopoly capitalist’ most hated by Zuma and his side-kick, College ‘Oros’ Maine – the Ruperts. How did it come to pass that the most corrupt section of the ANC is connected in all these ways to “white monopoly capital”? Further, how do the “clean” politicians of the ANC also end up in the same bed of monopoly capital? Is there, indeed, a more than passing connection between corruption in the ANC and “white monopoly capital”? Is there a connection between the break up of the ANC currently underway and white monopoly capital? In light of the SASSA crisis it is important to move beyond the smokescreens and hype put up by South Africa’s mainstream media and its analysts, and explore the deep connections between corruption and neoliberal governance (popularly known as ‘good governance’) that is promoted by Pravin Gordhan and his supporters. The wealth of any society is distributed among its various social classes through a range of mechanisms. In capitalist society, the means and processes of the distribution of society’s wealth range from the division of wealth between wages and profits; the markets in which goods are bought and sold serve to distribute wealth between the classes; for example, in the agricultural commodities market the wealth is extracted away from the small farmers and other producers toward financiers who control the world’s global markets in agricultural commodities. The system of taxation in a country also serves to distribute wealth between the classes; and the way the government (in any country a key economic actor) produces, buys and supplies goods and services to the mass of the population also serves to distribute wealth between the classes. The entire capitalist economy is organized around the making of profit for the capitalist, the owner of factories, shops, mines and farms: the means of producing goods and services. The entire system, therefore, is essentially about the way the wealth that is produced is distributed among the capitalists, the middle class, and the working class or poor people in a country. In any society there are people who steal something from others. Corruption, however, is not just theft (though in many cases it includes theft), but involves an illegal, hidden and unethical use of access to resources and power to transfer wealth and power to the benefit of oneself or for the benefit of one’s associates. Corruption can be done for a range of reasons, including for personal enrichment, enrichment of friends or relatives, and/or facilitating access to resources and power by yourself, friends and relatives. In the history of capitalism and in the formation of the capitalist class, corruption (and sometimes even more violent crimes) constitutes the most important way of creating wealth for a new capitalist class. In addition, as a result of the constant threat to the wealth of the capitalist resulting from competition and the instability of capitalism, capitalists must periodically engage in corruption – this illegal, hidden and unethical transfer of wealth and power – to maintain their wealth. In South Africa, for example, the wealth of all the rich white capitalists is founded on the theft of the land, the minerals beneath the land and other resources of the country. Also, it was founded on the exclusion from power of all social classes and groups from the black majority. During the process of the formation of the South African state in the early 1900s, the black middle class of the time – led by the ANC – attempted to get themselves included in the new power arrangements of the Union of South Africa, but this was rejected by the white capitalists and their colonial government in Britain. An important step in the development of any capitalist class is reached when the wealth this class acquired by theft, corrupt and illegal means is transformed into legal wealth; when they write and rewrite laws to legalize their wealth. For example, the land that was stolen by white settler capitalists over many years in South Africa was legalized with the Land Act of 1913. The initial legalization of corrupt wealth requires that the capitalist class creates a range of laws that maintain this ill-gotten wealth. These laws include property laws and by-laws (in cities and municipalities), laws around setting up businesses, the organization of state policies and taxes that favour the reproduction and maintenance of that wealth, and so on. Meetings between individuals and corporations to organize this corruption are sometimes legalized – and this is referred to as “lobby-groups” and so on. In many countries, such as France, “lobbyists” get paid a lot of money and spend a lot of money (legalized bribery) to persuade those in power to act in the interests of certain power groups. Once a capitalist class or section of a capitalist class has legalized its corruption, it has an interest in ensuring that the corruption of competitors is not legalized. By keeping them illegal, the ruling capitalist group can obstruct, weaken, or punish at will its competitors. At times, it may “turn a blind eye” to this corruption as long as it does not threaten its rule. It can also periodically use this dark side of capitalism to strengthen its position without running a risk of becoming illegal – in other words the established capitalists can “outsource” corruption. Because of their power these groups have created their own system of justice, in which they all agree to pay “traffic fines” for this corruption and theft. In South Africa recently, a number of banks agreed to pay “fines” for manipulating the rand. This parallel system of justice, which includes legal institutions like the Competition Commission, whitewashes corruption and allows powerful groups in society to evade the normal process of criminal justice. Along this line, think also of the bread cartel, which colluded to rob the poor of their already meagre wages and grants. 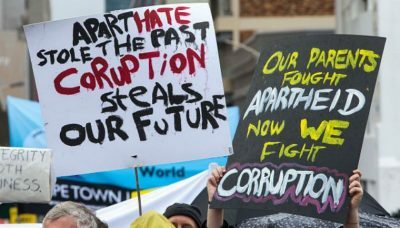 Corrupt groups in society – such as the ANC cadre or groups of new capitalists like the Afrikaner capitalists after 1948 – draw the wealth they transfer to themselves from different parts of society. There are four main sources of wealth, or circuits of wealth, from which the corrupt groups can steal. The first is from the capitalist class itself. There are many cases of this corruption in the financial markets, and daily we hear of reports of “insider trading,” which is corruption between and among financial market traders to steal from the capitalist class itself. The second is from the state. The third is to steal directly from the middle class, and fourth, they can steal directly from the working class. Corrupt groups focus on the lines along which wealth is distributed in society, where they “intercept” this wealth behind the scenes and direct it to themselves and friends. The wealth can be “intercepted” within the circuits of wealth of particular classes, as well as when wealth moves between the different circuits. Corrupt groups do not in general create wealth, they redirect it and consume it once it is produced. The line of distribution on which corrupt groups focus depends on the power this group enjoys in society. For example, groups like investment banks and currency trading groups are able to redirect wealth that is circulating in the financial sector by corrupt means. As I have argued, they have created their own systems of justice to ensure that their corruption is legalized. In order for corrupt groups to intercept wealth from the capitalist classes and the middle classes, they need control of important institutions like banks and large corporations. Weaker groups of emerging capitalists are forced to focus their corruption on less powerful groups in society – such as the working class. In order for them to intercept resources within the working class, and to intercept resources that move from the state to the working class, they need access to political office. Political office allows these groups to intercept transfers from the state to other classes as well, but their lack of power forces them to focus on transfers from the state to the working class. the transformation of South Africa into a constitutional state. the adoption of the concept or doctrine of ‘legal continuity’, which meant that all laws and agreements that were passed or entered into during colonialism and apartheid remained valid and could only be changed through the legal process. the new dispensation made it unconstitutional to punish anyone for any offence committed in the past if no law said it was an offence at the time. the capitalist corporations continued to be “juristic persons,” and this meant that all key rights conferred by the new constitution to protect people against abuses of apartheid (such as expropriation of property for very low compensation) also protected capitalist organizations. The doctrines of constitutionalism, constitutional continuity and illegalization of retrospectivity were not enough to defend monopoly capital. Monopoly capital did not trust the new black elite as it was not always clear if the black political elite now in government would resist the pressure of their constituency to redistribute wealth. The capitalist class, through a range of means, intervened to create other lines of defence against the pressure for redistribution of wealth. To protect the interests of monopoly capital, determined efforts were made to capture the ANC as an organization, and these efforts were already successful by 1992. In that year, the Mail & Guardian organized a retreat at Mont Fleurs outside Cape Town, where the consensus about a free market capitalist road began to emerge. Some of the people present were to be key in the adoption of free market economics or neoliberalism in post-apartheid South Africa. They included Trevor Manuel, Tito Mboweni, Rob Davies, Saki Macozoma, Jayendra Naidoo, and some of the biggest capitalists, Christo Wiese, Derek Keys and so on. It was these series of engagements that ended in the capture of the ANC by monopoly capital, and resulted in the adoption of “Growth, Employment and Redistribution” (GEAR) policy by the ANC in 1996. Another line of defence put up by (white) monopoly capital was to ensure that key capitalist organizations are protected against the South African state – which was black and could not be trusted – by foreign governments. Following the ascent of Trevor Manuel to the Treasury, five of South Africa’s large corporations were granted permission to become “foreign companies” by shifting their “home” addresses to London and New York. This move allowed these companies to move their wealth overseas. By 2001 the companies were exporting more than R7-billion in profits made in SA overseas. The ‘flags of convenience’ of these companies meant that they were now protected against South African people by their new-found “parents” – the UK and U.S. governments. From being South African companies, they now became foreign investors in South Africa! While the big five companies expressed this process in the most visible manner, the strategy of ‘flying flags of convenience’, even without moving the primary listing to foreign countries, has continued. Today almost half of the biggest companies on the Johannesburg Stock Exchange are controlled by foreign shareholders. Almost 75% of the companies have 30% or more of their stocks owned by foreign shareholders. This level of ownership is enough to control a company, and with the resources at the disposal of these foreign groups they are able to exert a major influence on the South African economy and on the South African state. Wall number four was also put up, and this mainly involved pressure on the new South African state to privatize the key assets of the state. If privatization was not possible, the state allowed these assets to fall into neglect so as to allow the “private sector,” meaning the big capitalist, to create “new industries” to substitute the state industries. Private health is one such example – the decline of state health has led to the consolidation of the rise of private health. The debacle around SASSA is another example of how the decline in the capacities of the state, a direct product of the neoliberal policies pursued by successive ANC administrations with the Finance Ministry at the vanguard, has led to the current situation in which a state organ cannot even process payments, notwithstanding the fact that the South African Revenue Services run an equally large, modern and sophisticated electronic system of filing and payments. Add to this that the entire Department of Home Affairs platform is now digitized and uses modern biometrics, and we can see how the SASSA crisis is one manufactured by vested interests. These four lines of defence created a fortress around capitalist organizations and the privileged white middle class, and ensured that their wealth would be preserved. This defence of capitalist and white privilege and power ensured that any new group of black capitalists that wanted to become rich could only be rich on one condition: by the mercy of white monopoly capital. This is how many ANC cadres such as Cyril Ramaphosa, Tokyo Sexwale and Patrice Motsepe became rich. This condition, however, was a recipe for conflict. Not only would the black working class grow restive over time, but the black middle class and the aspiring black bourgeoisie would have to find ways around these walls of defence. This battle was what set in motion the battle for the ANC. This battle began to take shape around what was called “the class project of 1996” (a code for the capture of the ANC by monopoly capital and neoliberalism); the battle grew into the Polokwane project that brought together Julius Malema and the ANC Youth League, Zwelinzima Vavi and COSATU, the black petty bourgeoisie at the local level (mainly in the bureaucracy of the local state), and sections of the aspiring black bourgeoisie such as Tokyo Sexwale and Ramaphosa. At this point in the battle, people like Nene and Gordhan were part of this broad church. Although this bloc had come to political office around the rhetoric of “radical economic transformation” based on the Freedom Charter – much as the Zuma bloc is now again trying to do – they had no real programme or plan on how to break through the stranglehold of monopoly capital and the defences it had put up over more than 20 years (1990 and before, to 2009). Without any programme, the new Polokwane bloc could not break through three of the four lines of defence put up by white monopoly capital. The economic situation of the middle classes – their key constituency – had been deteriorating and their indebtedness had been rising in the 15 years or so of the new democracy. As an historical bout of bad luck would have it, they also came into political office against the backdrop of a global economic crisis. This meant that even the crumbs that had been dished out to the Tokyos of this world were drying up. Black participation in the JSE began to decline, monopoly capital and its international counterpart demanded fiscal discipline and austerity and the state as a redistributive mechanism was frowned upon even more by those who held economic power in society. Thus the Polokwane bloc and the class it represented – the petty bourgeoisie, now dependent on their position in the state – had only one option to survive: through corruption, tenders and doing business with the state that employed them. Earlier I argued that there are four sources of corrupt enrichment in capitalist society. Recall that I argued that the first line is to divert resources from within the capitalist class. The second was to extract resources from within the state through large state contracts. The third was to extract resources from the middle class, and fourthly, from the working class. Three of these remained blocked, and only one (extracting resources from state transfers to the working class) was now open for this class and the Polokwane bloc. A new situation had arisen because in the Polokwane struggle monopoly capital and its allies in the ANC lost control of the ANC. The Polokwane bloc had breached one of the four walls of defence set up by capital – they had recaptured the ANC. This immediately opened up the possibilities of extracting resources meant for the poor working class communities, especially via the local state. The only option open to a weakened and defeated black middle class was to extract resources from the line that distributed resources from the state to the working class. At all levels of the state, but particularly at the local state, the new black elite has been extracting wealth for its consumption from resources meant for the working class and the poor. The scale of this corrupt extraction can be seen in the reports of the Auditor General year after year since the transition began. Billions and billions of rand are “lost” every year to “wasteful,” fruitless, and unauthorized expenditure. We can see this extraction from broken RDP houses, unfinished school buildings, pot holes on roads across the country, non-delivery of text books, waterworks that are sabotaged in order for fictitious tenders to be created, and the list goes on without end. The SASSA crisis currently unfolding represents a particularly ugly version of how this group is intercepting resources meant for the working class, but it is only the most visible one because it is now unfolding around a single date, April 1. The control of the ANC by the Polokwane bloc, however, did not bring with it the power to breach the three other lines of defence set up by monopoly capital. The constitutional and legal defences are still intact, and litigation against the Zuma state has intensified at all levels. Also, massive capital flight and export continues, and various means are implemented to accelerate this. Lately, transfer pricing has become a favoured means to export profits to overseas destinations. The swindling of the middle class, especially the affluent white middle class, remains the preserve of big capital and its banks, which are jealously guarding the banking space for new entrants and find all manner of ways of collapsing upstarts that want to disturb the current division of the market into spheres of influence. Zuma, who had no programmatic or political interest in the struggle against monopoly capital, went back to his old ways of responding to the intractable nature of the transition: petty corruption. Remember that before his rise to the throne, Zuma was facing hundreds of petty corruption charges. What the new situation opened up was more of the same: resource extraction of the pettiest kind. So followed Nkandla, a large dose of petty theft. The Treasury under Gordhan was recaptured by monopoly capital, as he was forced to continue dishing out all the neoliberal formulas of his predecessor, Trevor Manuel. The continuation of the Treasury’s orientation toward neoliberal economics of monopoly capital was facilitated by the difficult conditions of the global economic crisis on the one hand (he came into the Treasury just after the crisis), and the lack of any programme (besides rhetoric) on the part of the Polokwane bloc. Without any programme, the man who was going to put an end to the “class project of 96” had no clue on what was to be done – and when you don’t know you just keep going. Zuma’s propensity for petty corruption, his lack of any real ideas (big or small) on any issue and his patent helplessness in running the ship of state – all these facilitated Gordhan’s capture by monopoly capital. The entry, or rather re-entry, of sections of the Polokwane bloc that had pretensions to being big capitalists also dampened any appetite for a fight with monopoly capital. The likes of Cyril Ramaphosa, deeply indebted to monopoly capital, deeply intertwined with it (Lonmin) had no appetite for this fight and did not believe in radical economic transformation. The attitude of this faction was that it could be rich by being “clean,” and were clearly at odds with the Zuma group of petty thieves. Those who still believed in the rhetoric of the Freedom Charter, like Julius Malema and Irvin Jim, now came face to face with the fact that no amount of radical rhetoric can shift the entrenched nature of monopoly capital. They also came face to face with the fact that the Zuma section of the bloc and the Ramaphosas of this world had no appetite for the fight, and for the rhetoric as well. They split off from the Tripartite Alliance and the ANC, and went on to continue with their rhetoric and theatrics. In the course of all these struggles (the run-up to Polokwane and the immediate beyond), COSATU became less and less of a force to be taken seriously by the other factions in the Polokwane bloc. The Marikana massacre bled the key actor in the pro-Zuma blocs in COSATU – in particular the NUM – and with Numsa leaving the sorry state of COSATU is there for all to see. The South African Communist Party (SACP), as usual, puts its head in the sand, throws around a bit of rhetoric, and hopes that history will lead to socialism in the end. Caught between the petty corruption of Zuma and Gordhan’s shift to the right, the SACP defends Rupert (anything but the Guptas), likes the rhetoric of “radical economic transformation,” and in general swings wildly between the two main protagonists in the struggle of the excluded petty bourgeoisie against white monopoly capital. In the corner of monopoly capital stands Gordhan. As the conjuncture of circumstances would have it, the SACP and COSATU stand in this corner. As a result of his anti-Zuma orientation, Julius Malema find themselves (temporary?) allies of Gordhan, and therefore of white monopoly capital. In the other corner stands (?) Zuma, his family, the consuming black petty bourgeoisie at the local level, and of course the Guptas. The arrival of the Guptas on the scene (initially introduced by the Mbeki bloc), and their linking up with the Zuma bloc, has led to an intensification of hostilities in the struggle for the extraction of resources from the state. Up to then, there was no actor in the Zuma or Polokwane bloc more broadly, who had the appetite and resources to fight white monopoly capital. Also, up to then there was no actor that was involved directly in real production – people like Ramaphosa are stock millionaires, not real production capitalists. The importance of the Guptas in this battle cannot be understated. The Guptas are providing four key elements that have been lacking in the Zuma bloc. First, as we indicated already, the Guptas are a producing capitalist group and not just a group of consuming individuals. Second, the Guptas have financial resources that can “take on” big capital in South Africa. Third, the Guptas have the organizational skills that come with organization of production, and they have had to “organize” the whole bloc, even to the extent of dishing out cabinet posts! Fourth, if the Guptas succeed in making inroads into the circuits of wealth that run between the state and large capitals – the state enterprises are key in this circuit – they may well break into the heart of the circuits that run within the capitalist class itself. An important project of the Guptas will be that of having its own banking arm. This aspect of the project will also give it access to extracting wealth from the affluent middle classes, or in the beginning from the black middle classes. With the ability to issue loans to the middle class on a significant scale, and backed up by access to large state contracts – it will most certainly be game on! In the short term, the most important strategic goal is to capture the Treasury, currently the most important bastion of monopoly capital within the state. A common error in the analysis of what is clearly an important strategic project for the Guptas – the capture of the Treasury – is that the Guptas only want to “loot.” Now, the idea of looting is always associated with corruption, in particular with consumption, and not production. This is a fundamental error of theory and analysis. The Eskom contract around the Tegeta coal mining contracts is a classic example of the processes of the legalization of corruption. It therefore provides an interesting example of how monopoly capital and its “fourth estate,” the media, would cry wolf while they themselves engage in similar kinds of practices. The main purported “sin” of the Guptas is that they got “paid an advance” on coal that they did not have, and in turn used this advance to purchase the mine and later deliver the coal. Now, this kind of financial engineering is standard practice with the likes of Goldman Sachs (see Goldmans Greek debt swindle), derivatives of all kinds (remember that what triggered the global economic crisis was the housing loan derivatives), and in many cases straightforward theft of state resources. If we leave the world of financial engineering (that is the legalized theft of social wealth) the Eskom deal is classic in another and more important sense. The formation of large capitals in South Africa was underwritten by massive state subsidies over several decades. And guess who was key in the provision of these subsidies? Eskom! For decades, while the black working class had no access to electricity, Eskom ran the lowest electricity price regime in the world for big capitals. A combination of cheap electricity (Eskom), cheap steel (ISCOR) with cheap labour was the recipe that created today’s white monopoly industries. The Tegeta deal is borrowing from an old book. South African monopoly capital is aware of the threat posed by a victory of the Guptas: the Guptas may just succeed in legalizing their corruption alongside that of white monopoly capital. Sensing this, big capital and its allies are putting up a fierce resistance, and this threatens to break up the ANC completely. The battle for the Treasury expresses this issue most acutely, but the battle is equally acute across all the big state enterprises. Of importance in this struggle will be the battle for the hearts and minds of the population. Who will be able to win the battle for public opinion? At this point in the battle the Guptas and Zuma (a minor player in this historical drama) have the odds stacked against them. Almost the entire media sings from the same hymnbook: the Guptas are corrupt, they are a danger to the “nation,” (here xenophobia even comes into it) and they should be denied citizenship, etc, etc. On the other hand, it is easy to mistake the noise of the media for real support for the Gordhan corner. The Guptas may therefore be under siege, but they have a crucial trump card, so to speak. Although the Polokwane project has broken up, the systemic social, political and economic problems that brought it into being do not only still exist – they continue to deepen. The economics of austerity implemented by Gordhan continue to pulverize the black middle class and the black working class. The levels of indebtedness of South African consumers has been steadily rising, and the only remaining question is when the tipping point will be reached: when are we going to see large-scale and politically explosive defaults among the middle classes? These layers of the ANC apparatus see Gordhan’s “clean government” crusade as directed against them. They see a repeat of the “class project of 1996,” and they are learning in the process not to depend on their traditional allies – the SACP and COSATU. 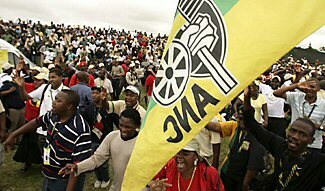 Through its various factions in the ANC – in particular the Premier League – this group is digging in for a bitter fight for the ANC. This fight will break the ANC to pieces, but for this class there is no other option. The consequence of this alignment of forces is that the Gordhan group has to try and launch assaults from outside the ANC. Thus the need for “stalwarts” and all kinds of “eminent persons” that appeal to the Zuma bloc to desist from the road of corruption. Their capacity to contest within the structures of the ANC has been considerably weakened by their association with monopoly capital and its vanguard in the person of Gordhan. Free and Egalitarian South Africa? At the heart of the Zupta versus Pravin battle is a battle between two kinds of corruption. On the one side is a corruption that has not yet been able to legalize itself, a corruption of excluded sections of the black middle class and those who aspire to be rich capitalists. At this point this corrupt faction steals directly from the poor, but it seeks to legalize itself and “play” in the greener pastures of corruption in the circuits of wealth that move within the capitalist class and the state itself. On the other side stand the front troops of legalized corruption – the corruption of white monopoly capital. Behind their appeal to the “rule of law,” to “clean government,” to “anti-corruption” stand the defence of privilege that has not only excluded aspiring black capital, but has produced a deep, structural and enduring poverty of millions of working class South Africans. The prospects of a victory of monopoly capital, a Cyril Ramaphosa victory in the ANC, and therefore a recapture of the ANC is currently looking extremely slim. On the other hand, the Zupta bloc is facing formidable odds as it tries to breach the walls put up by monopoly capital. What South Africa may indeed be facing is what Marx called a “peace of the graveyard,” a “common ruin of the contending classes.” With monopoly capital unable to flush the Zuptas out of the state, and the Zuptas not able to impose a deal that legalizes them as co-thieves of social wealth, we may see a ruin of all classes. In this whole battle for Treasury and the state between Zuma and Gordhan, the real elephant in the room is this: how did it come to pass that almost 40 million South Africans are dependent on meagre grants handed out by the state? This is the real inheritance of Mbeki, Manuel, Nene and Gordhan and the big capitalist groups they represent. Both the monopoly capitalists and the Zuptas have corrupted something very precious in South Africa’s history – they have corrupted a proud and militant tradition of struggle for social justice; they have corrupted South Africa’s dream of a free and egalitarian nation. With a ruin of all classes increasingly looking likely, the only way out is for the working class to come out of its period of apathy – but this will constitute a whole new historical period. Oupa Lehulere is an activist in the social movements and is currently based at Khanya College, a social justice and movement building institution based in Johannesburg, South Africa. This article first published by Pambazuka News .